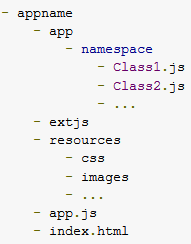 If you are new to Ext-JS applications deployment and if you are using Sencha SDK tools, there are a number of things that you need to do correctly to produce correct jsb3 and app-all.js and all-classes.js files. This blog lists a number of errors you may get while using Sencha SDK tools for Ext JS deployment. We have used SDK tools version 1.2.3 while creating this blog entry. This error comes when you are using index.html and not the URL deployed on a server. This error may come if there is a typing mistake in the URL you have specified. Check that your URL ‘http://localhost/yourApp/index.html’ is correct by typing it in a browser. Make sure that your application Context (yourApp) is correct, the file name is index.html and this file exists in your context folder. This issue is normally reported while using 64 bit JRE and during sencha build command execution. You can install 32 bit JDK/JRE too. In your command prompt and before running your sencha commands, set your path variable to include your 32 bit JRE. If both sencha create and sencha build commands are working but your jsb3 file does not include Ext-js or your app js files; and newly created all-classes.js and app-all.js are there but they does not contain anything. Please make sure that you have the following things right. Is your folder structure exactly same as recommended in ExtJS doc or have you changed something? Please make sure that your index.html and app.js are in same folder. You may prefer to keep your html files and js files in separate folder and this may have caused your deployment process to fail. Also make sure that you are using Ext.Application() and not trying deployment tools on Ext.onReady(). Have you changed your app folder name with your application name? If yes, please make sure to specify the correct path in Ext.Loader configuration. Your app may run fine if you have specified your App Folder name only in Ext.application but you may need the Ext.loader configuration for your deployment commands to work. Happy Ext-js Deployment! If you face any further issues (or if you have resolved other issues), you can share the details in the comments section. This entry was posted in Ext-JS Sench Touch and tagged Ext JS Deployment, Sencha SDK Tools. Bookmark the permalink.